OCEANSIDE ― A gray whale was spotted off the coast of Oceanside on Nov. 19 with its tail in the air. “First southbound gray whale of the 2016-17 season,” Capt. Shane announced to the passengers aboard an Oceanside Adventures’ charter. Each year, more than 20,000 Eastern Pacific Gray Whales travel over 10,000 miles round-trip from the seas of Alaska to the lagoons of Baja, California. Some of the gray whales continue further south into Cabo San Lucas and the Sea of Cortez. This is the longest mammal migration known. 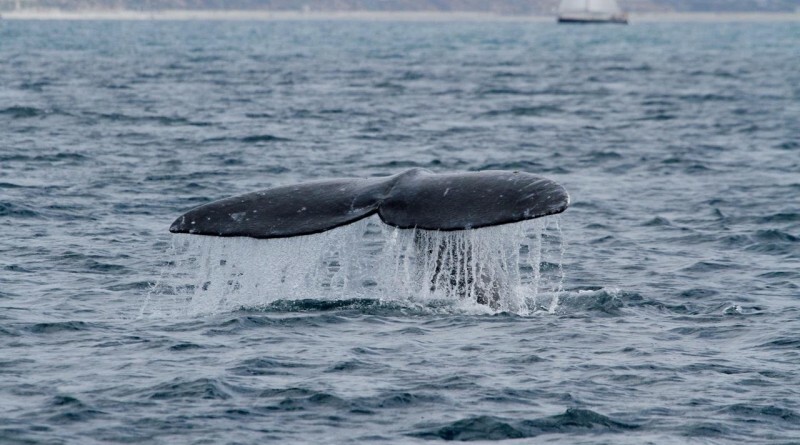 The gray whales typically migrate from mid-December through April. Some of the pregnant gray whales get a head start on the coastal journey to give birth in the warmer lagoon waters of Baja. After the gray whales give birth and their calves grow strong, they migrate back to the feeding grounds in Alaska. “In only 73 feet depth of water this gray whale was very close to the harbor. Gray whales are coastal navigators so it’s not unusual to find them close to shore and along the backside of the Channel Islands,” Carla Mitroff, manager of Oceanside Adventures, said. The gray whales are 36 to 46 feet long, weigh 38,000 to 99,000 pounds and have a life span of 30 to 70 years, according to the Aquarium of the Pacific.